From the 80 s progressive pop of Missing Persons to the technically "over the top" music of UK and Frank Zappa to Terry s Grammy-winning work with Jeff Beck—his playing has inspired some truly great compositions and instrumental performances. He can take things from four-on-the-floor pop to smoking double-kick grooves. He will fly into blinding double-stroke fills only to chill with a delicate, melodic part that s perfect for film soundtracks. 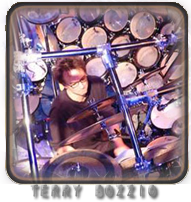 TerryPack I shows a player that s a hybrid of punk enthusiasm and incredible chops that showcases custom-made China cymbals and custom-made melodic toms.